One of my dreams in life is to have a Nancy Myers kitchen with a huge stove, an island the size of Rhode Island, beautiful pots and pans and my Grandma's bowls and just whip up treats on a whim like Meryl Streep in It's Complicated. But while I'm working hard to strike it rich, I'll have to continue baking with my minimal counter space and seen-better-days pans. To me, baking is one of the most relaxing and crafty things to do. I like to just look at a recipe and see how I can make it simpler and then wing it. 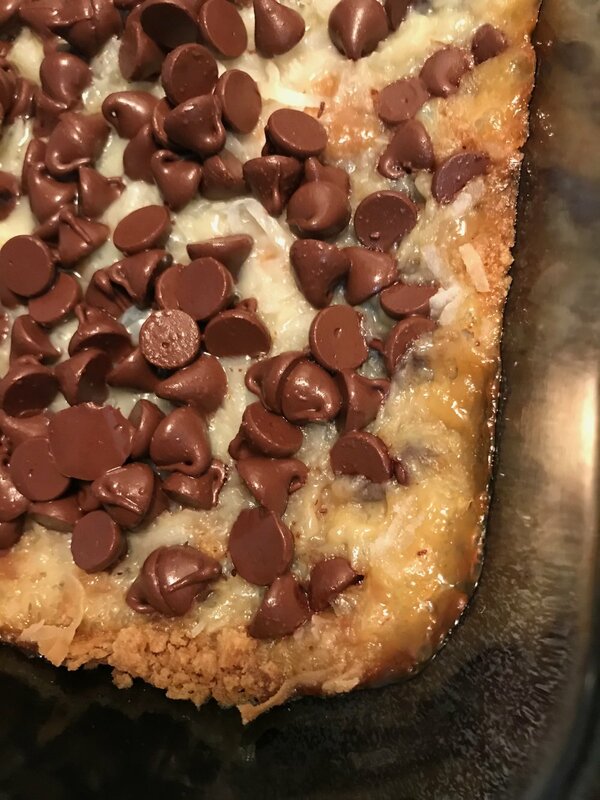 One of my favorite things to make are Magic Cookie Bars. EVERYONE loves them. I get tons of requests (sometimes demands) for THE cookies. 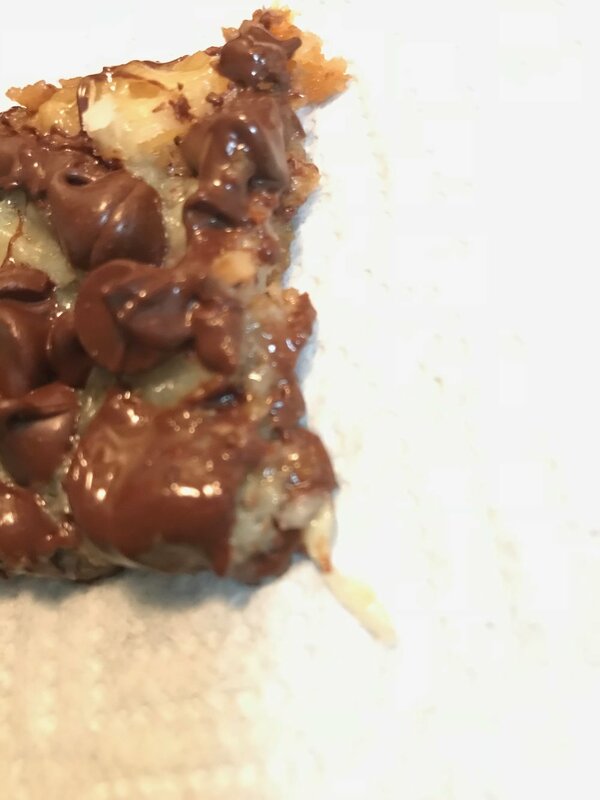 They are super easy to make, not a lot of mess and super delicious. 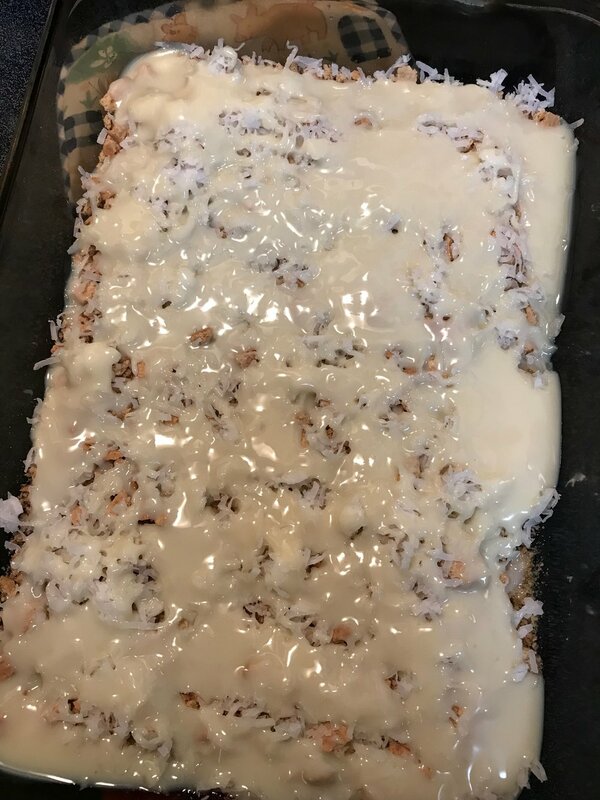 Here is my "recipe" for Magic Cookie Bars. The nice thing is there is no measurement or bowls- everything is in the pan! Easy clean up! * side note: it HAS to be butter. It should always be butter. The difference CAN be noticed. Okay, so here we go! First, preheat the oven to 325° for the glass pan or 350° for the metal. I just throw the butter in the pan and pop it in the oven to melt while it's heating up. Two birds, one stone, yo! 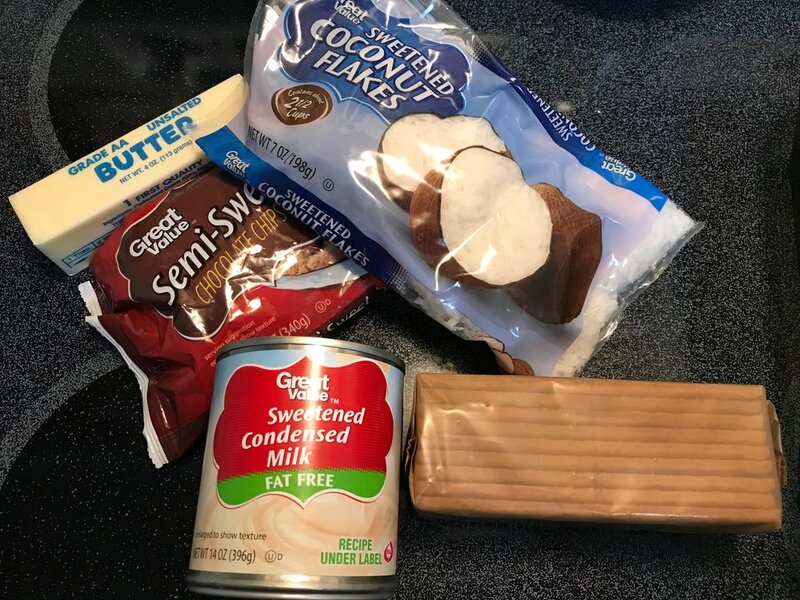 While the butter is melting, crush the graham crackers. I just leave them in the package and squish them- there can be little pieces left. Super therapeutic. Once the butter has melted, take the pan out of the oven and spread the cracker crumbs across the bottom of the pan. The butter will soak into the crumbs- layer one of the magic. So now, the "official" recipe calls for the condensed milk, chocolate and then coconut. I usually always do milk, then coconut with chocolate last. But this time, I lived dangerously (aka forgot) and put the coconut on first then poured the milk over. Excellent mistake- I mean decision. The coconut was completely covered in butter and the milk (which caramelizes as it cooks). Then I pour the chocolate chips all over the top and throw it back in the oven for like 20-25 minutes. The chocolate chips should look a little gooey and the edges should be golden brown. Now is the difficult part- letting them settle so A. they take shape and B. you don't burn your mouth off. They are delicious after about 15 minutes of sitting, but even better once they've been in the fridge for awhile. I couldn't wait. Sooo gooey. Dec 29 A hard, investigative look into the 9 times Taylor Swift has a drink on Reputation.